The great knot (Calidris tenuirostris) belongs to the family Scolopacidae under the order Charadriiformes. The family Scolopacidae comprises fifteen genera, including genus Calidris. The genus Calidris is the genus of knots and sandpipers. The genus Calidris comprises twenty-four species, including Calidris tenuirostris. The species Calidris tenuirostris was first described by Thomas Horsfield M.D. (May 12, 1773 – July 24, 1859), an American physician and naturalist, in the year 1821. The knot species Calidris tenuirostris is monotypic. With drastic decline in numbers, especially in the passage grounds, the Calidris tenuirostris is listed as Endangered by the IUCN (International Union for Conservation of Nature). 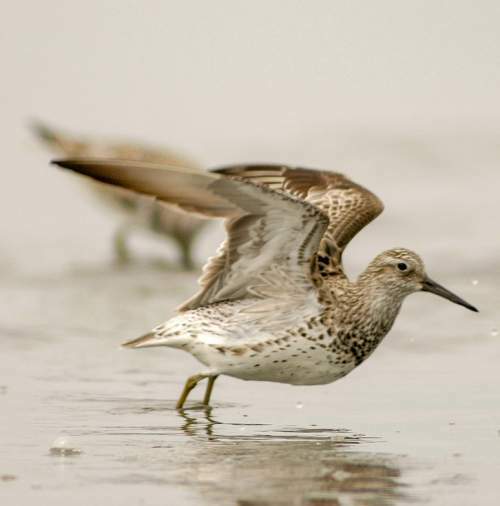 Recently updated and current topic in Bird World: Great knot - Calidris tenuirostris images. 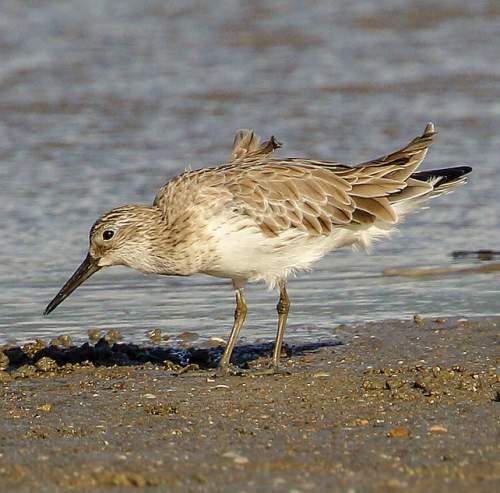 The great knot (Calidris tenuirostris) belongs to the family of sandpipers and knots, the Scolopacidae. 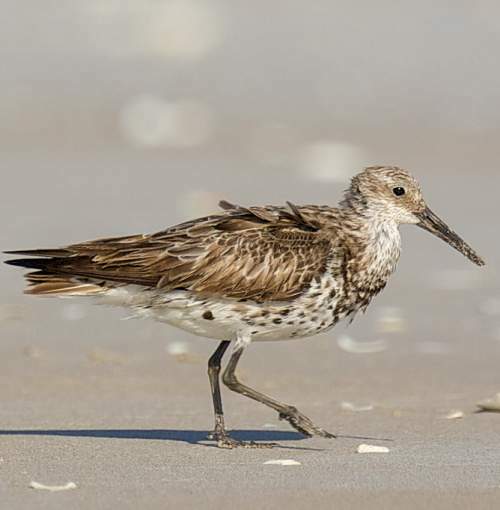 The great knot is distributed in far northeast Russia, coastal Australia, southeast Asia, India, Bangladesh, Pakistan and eastern Arabian Peninsula. These knot species are listed as "Endangered" by IUCN. These knots are monotypic species. The great knot (Calidris tenuirostris) is a large knot, measuring 25 to 30 cm in length and weighing 115 to 250 grams. The wingspan is 55 to 65 cm. 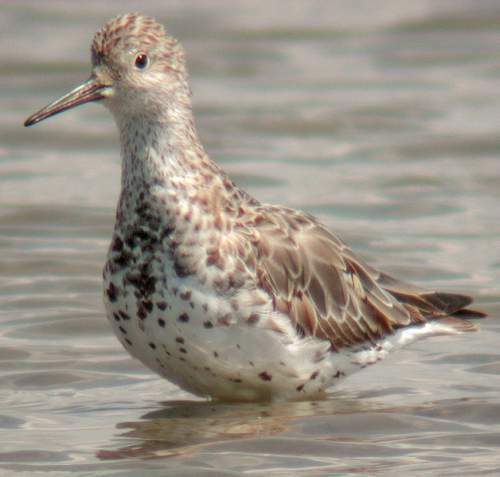 The great knot has grayish upperparts with dark brown mottling. The head and breast have dark streaking. The underparts are white with scattered spotting. The wintering birds are paler. The bill is medium-sized, thin and dark. The legs are short and grayish. The irises are dark brown. There is a pale eye-ring. Their call is a soft whistling, twittering sound. The great knot is distributed in northeast Siberia (Russia), Australia, southeast Asia, Bangladesh, India (including Andaman and Nicobar Islands), Sri Lanka, Pakistan and the eastern Arabian Peninsula. Vagrant great knots have been recorded in USA, United Kingdom, Middle East, Spain, Norway, Netherlands, Ireland, Denmark and New Zealand. 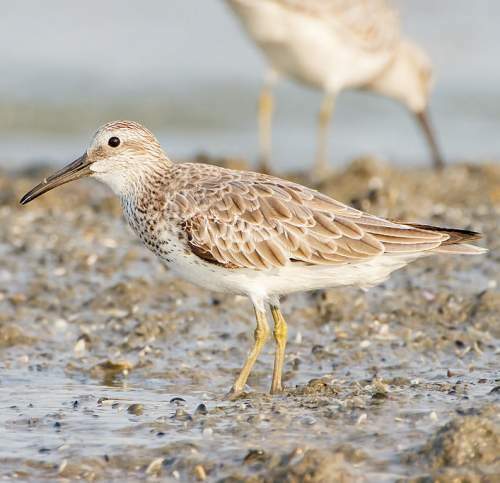 The Important Bird and Biodiversity Areas (IBA) of these great knot species in UAE are Marawah Island, Khor Al Beidah and Khor Al Beidah. The IBA in Singapore are Ubin-Khatib and Ubin-Khatib. The IBA in Saudi Arabia is Tarut Bay. The IBA in Russia are Rekinninskaya bay, Perevolochny bay, Ola lagoon, Moroshechnaya River, Malakchan bay, Khayryuzova bay and Babushkina and Kekurnyy Gulfs. The IBA in Malaysia is Sadong-Saribas coast. The great knot species does not normally occur in forest. It normally occurs in altitudes between 0 to 1600 meters. The artificial ecosystems and habitats of these species include coastal water storage tanks and coastal aquaculture facilities. 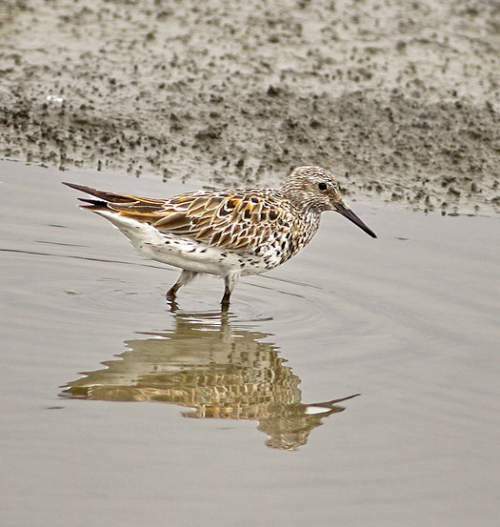 The natural ecosystems and habitats of these great knot species include subarctic grasslands, tundra grasslands, large lakes of Arctic region, marine lakes, mudflats, shorelines, estuaries and tide pools. The diet of the species consists mainly of plant matter like berries in the breeding grounds. Berries, insects, spiders, molluscs, crustaceans, annelid worms and echinoderms are their primary food during the winter and on passage. The breeding season of the great knot species is during subarctic summer in May and June. These birds are monogamous and territorial. The breeding habitat includes plateaux or gentle slopes with montane tundra. They nest in depression in moss. The clutch contains four eggs. The chicks hatch out after 22 days of incubation and fledge after 20 days. The male knot care for the hatchlings while the female moves southwards soon after hatching of the eggs. The great knot species is fully migratory. The breeding populations occur in northeast Siberia (Russia). They migrate southwards in July, mainly to Australia for wintering, making several stopovers enroute. The wintering populations of the knot species are mainly distributed in Australia. The return migration to the breeding grounds occurs from March to April. These knots also winter in the southeast Asian coastline, coasts of Bangladesh, India (including Andaman and Nicobar Islands) and Pakistan and the eastern coast of of the Arabian Peninsula (del Hoyo et al. 1996). The global population size of the great knot (Calidris tenuirostris) is estimated to number about 292,000 to 295,000 individual birds (Wetlands International 2015). The overall population trend of the species is considered to be decreasing. In most of its range, this species is reported to be uncommon to rare. The generation length is 7.4 years. Its distribution size is about 1,920,000 sq.km. Ecosystem degradation, ecosystem conversion, severe weather, climate change, loss of stopover habitats, oil exploration and pollution are the main threats that may endanger the survival of the species. 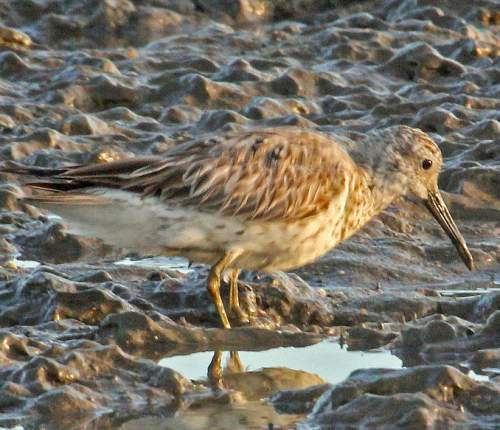 The great knot (Calidris tenuirostris) species has approached the thresholds for being Vulnerable under the range size criterion, under the population trend criterion and under the population size criterion. The IUCN (International Union for Conservation of Nature) has categorized and evaluated the knot species and has listed it as "Endangered". 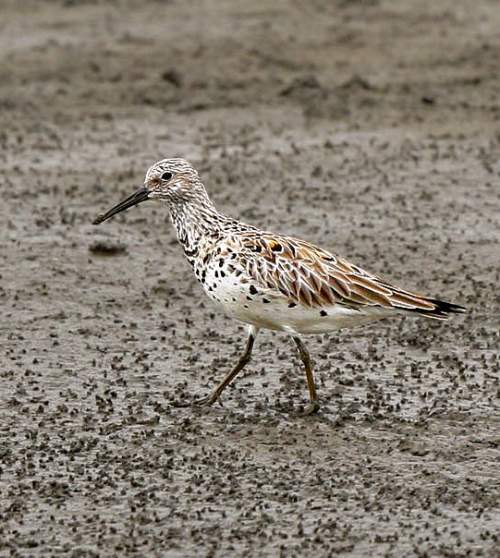 The CITES (Convention on International Trade in Endangered Species of Wild Fauna and Flora) status is ‘Not Evaluated’ for the great knot (Calidris tenuirostris). The great knot (Calidris tenuirostris) is closely related to the red knot (Calidris canutus) and surfbird (Calidris virgata). 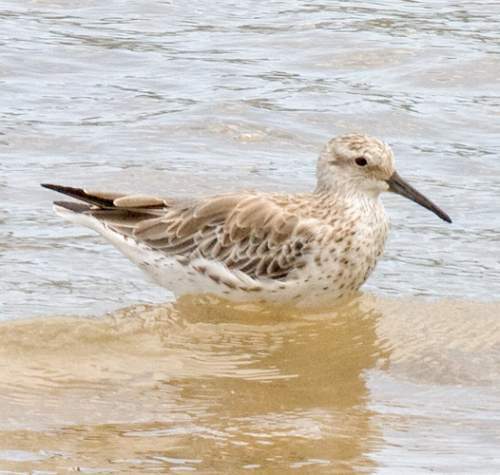 Recently updated and current topic in Bird World: Great knot - Calidris tenuirostris. The Ross's goose (Anser rossii) belongs to the family Anatidae under the order Anseriformes. The Anatidae is the family of ducks, teals, goose and swans. The family Anatidae was first introduced by William Elford Leach, MD, FRS (2 February 1791 – 25 August 1836), an English zoologist and marine biologist, in the year 1820. The family Anatidae comprises seven subfamilies, including Anserinae. The subfamily Anserinae was first described by Nicholas Aylward Vigors (1785 – 26 October 1840), an Irish zoologist, in the year 1825. The subfamily Anserinae is polytypic and contains three genera, viz., Cygnus, Anser and Branta. The genus Anser was first introduced by Carl Linnaeus (23 May 1707 – 10 January 1778), a Swedish botanist, physician and zoologist, in the year 1758. The genus Anser is polytypic and comprises eleven species, including Anser rossii. The goose species Anser rossii was first described by John Cassin (September 6, 1813 – January 10, 1869), an American ornithologist, in the year 1861. The species Anser rossii is monotypic and named in honor of Bernard R. Ross of Canada's Northwest Territories. 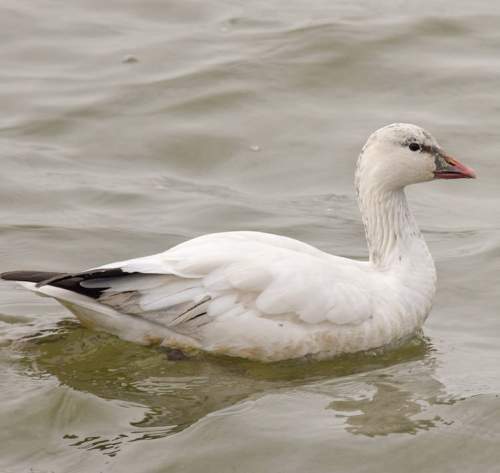 Recently updated and current topic in Bird World: Ross's goose - Anser rossii images. 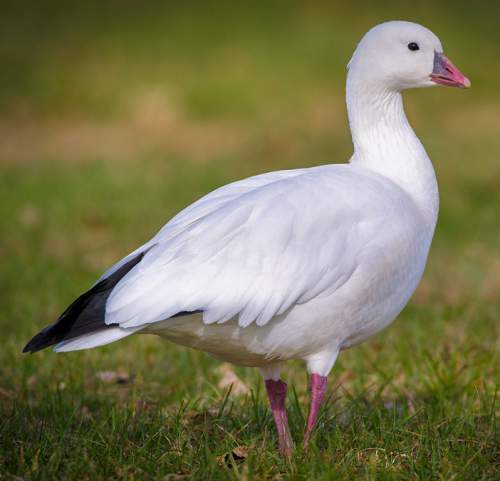 The Ross's goose (Anser rossii) belongs to the family of duck, goose and swan, the Anatidae. The Ross's goose is distributed over Canada, USA and Mexico in North America. This goose species is fully migratory. This goose is monotypic species. The Ross's goose (Anser rossii) is a medium-sized goose, measuring 55 to 65 cm in length and weighing 1200 to 1900 grams. The male is slightly larger. The wingspan is 360 to 400 cm. 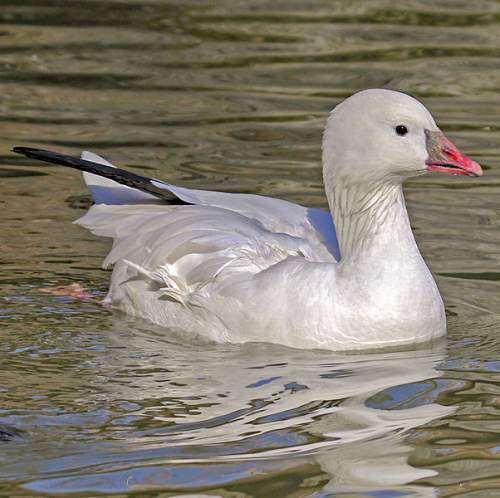 The Ross's goose has overall white plumage, except for the black wing tips. 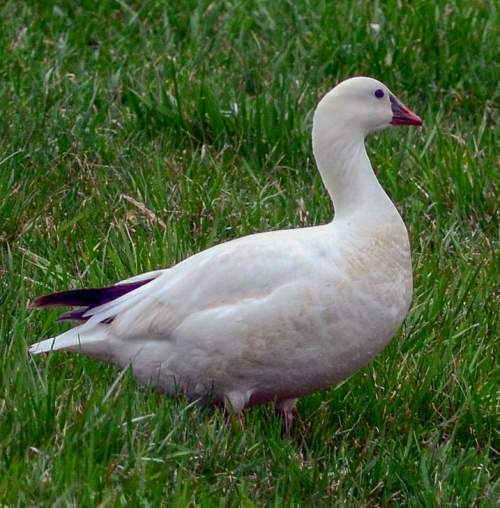 It appears similar to snow goose, but much smaller. Dark morphs of these species are very rare. The bill is relatively short and pinkish, with paler tip. The base of the upper beak is grayish. The irises are blackish. The legs and feet are pink. The call is a loud, repeated "quoke.. quoke" sound. The Ross's goose is distributed in Arctic region, Northwest Passage and western Hudson Bay in Canada, north Alaska (USA), southern USA (California, Arizona, New Mexico, Texas and Louisiana) and north Mexico. Passage birds are found in Canada and USA along the migration route. Vagrant birds have been recorded in Netherlands, United Kingdom and Russia. The Important Bird and Biodiversity Areas (IBA) of these goose species in Canada are Queen Maud Gulf, Barber Lake and McConnell River. The IBA of these birds in Mexico is Complejo de Humedales del Noroeste de Chihuahua. The Ross's goose species does not normally occur in forest. It normally occurs in altitudes between 0 to 2500 meters. The artificial ecosystems and habitats of these species include agricultural fields, pasturelands and water storage tanks. The natural ecosystems and habitats of these species include tundra grasslands, large lakes of Arctic region, inland cliffs, inland wetlands and freshwater lakes. The diet of the species consists mainly of Plant matter. Grass, sedges, leaves, stems, shoots, roots, aquatic vegetation, wild seeds and grains are their primary food. 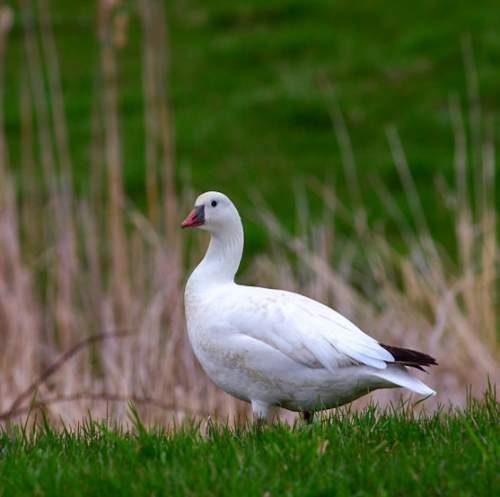 The breeding season of the Ross's goose species is during May and June in most of its breeding range. These birds are monogamous and territorial. The breeding habitat includes large, rocky, scrubby, grassy, predator-free Arctic islands. The nest is a scrape on the high ground. The eggs are dirty white with pale blotches. The goose species is fully migratory. The breeding populations occur in Arctic region, Northwest Passage and western Hudson Bay in Canada and north Alaska (USA). They migrate to the wintering grounds in July and August. 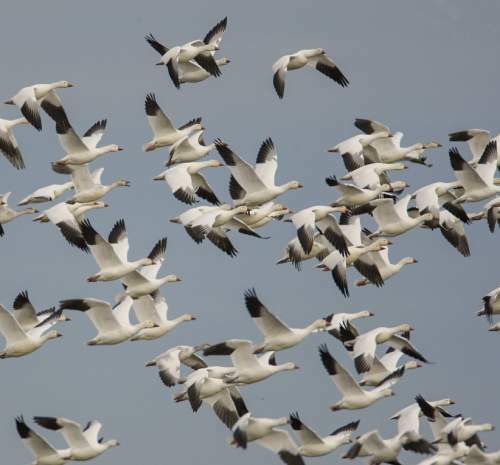 The wintering populations of the goose species are distributed in southern USA (California, Arizona, New Mexico, Texas and Louisiana) and north Mexico. The return migration occurs in early summer. The global population size of the Ross's goose (Anser rossii) has not been estimated. The overall population trend of the species is considered to be increasing. In most of its range, this species is reported to be uncommon to rare. The generation length is 8.6 years. Its distribution size is about 3,960,000 sq.km. Ecosystem degradation, ecosystem conversion, severe weather, climate change, sport hunting and capture of adults and juveniles for pet-trade are the main threats that may endanger the survival of the species. The Ross's goose (Anser rossii) species does not approach the thresholds for being Vulnerable either under the range size criterion, or under the population trend criterion or under the population size criterion. 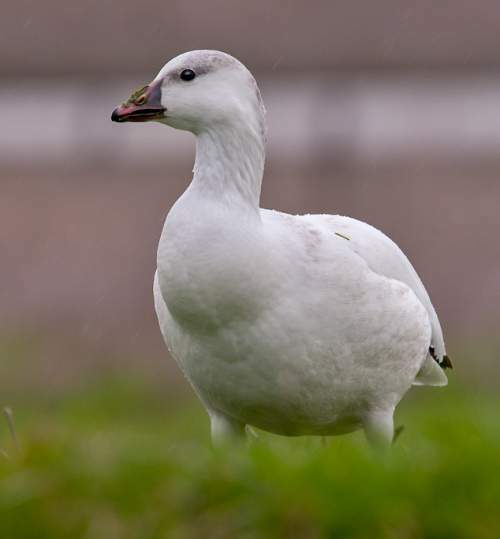 The CITES (Convention on International Trade in Endangered Species of Wild Fauna and Flora) status is ‘Not Evaluated’ for the Ross's goose (Anser rossii). 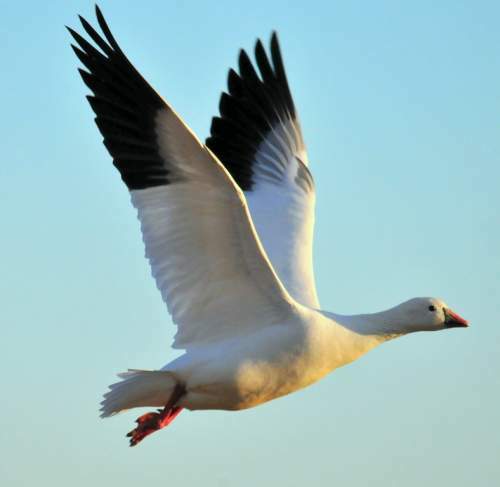 The Anser rossii is closely related to snow goose (Anser caerulescens) and the emperor goose (Anser canagicus). 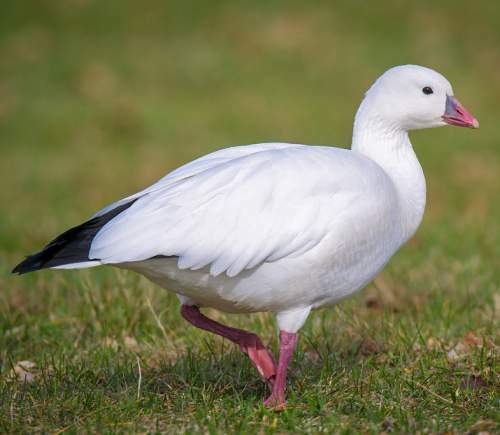 Recently updated and current topic in Bird World: Ross's goose - Anser rossii. The Louisiana waterthrush (Parkesia motacilla) belongs to the family Parulidae under the order Passeriformes. The Parulidae is the family of New World warblers or wood-warblers. The family Parulidae was first introduced by Frank Alexander Wetmore (June 18, 1886 – December 7, 1978), an American ornithologist and avian paleontologist, in the year 1947. The family Parulidae comprises seventeen genera, including genus Parkesia. The genus Parkesia is polytypic. The genus Parkesia was first described by Sangster, in the year 2008. The genus Parkesia contains species Northern waterthrush (Parkesia noveboracensis) and species Louisiana waterthrush (Parkesia motacilla). The species Parkesia motacilla was first described (as Seiurus motacilla) by Louis Pierre Vieillot (May 10, 1748, Yvetot – August 24, 1830, Sotteville-lès-Rouen), a French ornithologist, in the year 1809. The species Parkesia motacilla is monotypic. 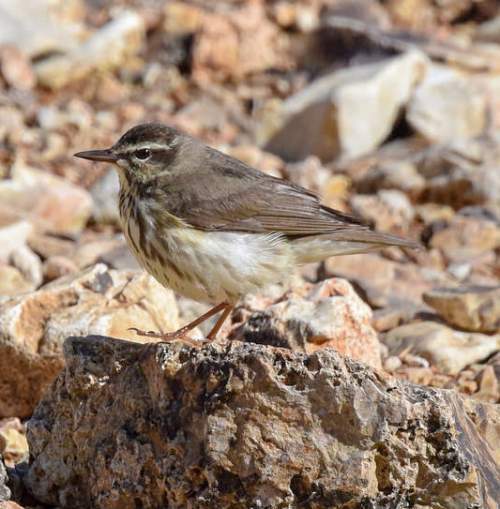 Recently updated and current topic in Bird World: Louisiana waterthrush - Parkesia motacilla images. The Louisiana waterthrush (Parkesia motacilla) belongs to the family of New World warblers and waterthrush species, the Parulidae. The Louisiana waterthrush is distributed in North America, South America and Caribbean. 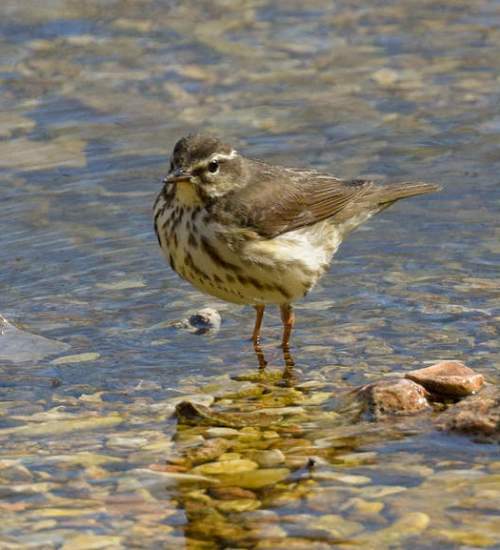 These waterthrush species are fully migratory. These waterthrush species are monotypic species. The Louisiana waterthrush (Parkesia motacilla) is a medium-sized waterthrush, measuring 15 to 16 cm in length and weighing 17 to 26 grams. The Louisiana waterthrush has brown upperparts. The white underparts are streaked pale brown. The flanks and undertail are pale buff. There is a white supercilium extending down to the rear of the neck. The bill is sharp, long and grayish. The irises are dark brown. The legs and feet are pale pink. The call is a series of shrill, slurred whistling and "chink.. chink" sound. 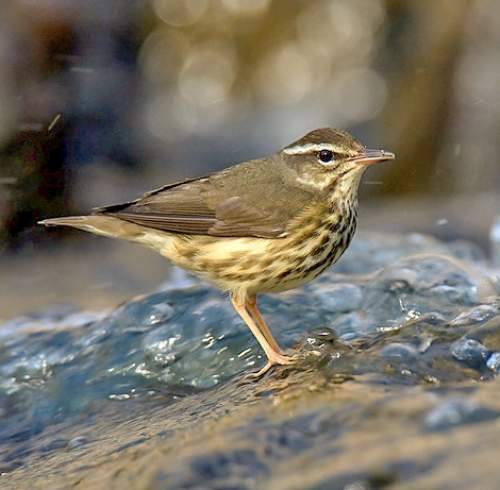 The Louisiana waterthrush is distributed in southeast Canada, eastern USA, Mexico, Belize, Guatemala, Honduras, El Salvador, Nicaragua, Costa Rica, Panama, Colombia, Venezuela and the Caribbean islands. Passage birds have been observed in Florida, coastal regions adjoining Gulf of Mexico and areas adjoining southeastern coast of USA. Vagrant birds have been observed in Greenland (Denmark) and Spain. 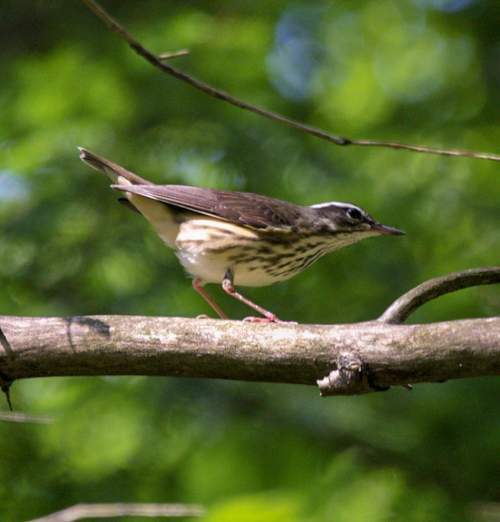 The Louisiana waterthrush species have low forest dependence. They normally occur in altitudes between 0 to 100 meters. The natural ecosystems and habitats of these species include temperate forests, temperate shrublands, wooded ravines, inland wetlands, streams and rivers. The diet of the Louisiana waterthrush species consists mainly of insects. Aquatic insects, terrestrial insects, crustaceans and molluscs are their primary food. They forage actively in running water. They glean their prey from the leaf litter and also hawk flying insects. The breeding season of these species is from April and July. These birds are monogamous and territorial. The breeding habitat includes wooded areas near water sources. The nest is built in rock crevices, elevations near mud bank and amongst tree roots. The nest is built with pine needles, grass, leaves and twigs. The clutch contains four to six eggs and the female incubates them. The chicks hatch out after 12 days of incubation and fledge after nine or ten days. The parents feed the young for further four weeks. The Louisiana waterthrush species are fully migratory birds. The breeding populations occur in southeastern USA and southeastern Canada (southern Ontario). They migrate to the wintering grounds in July and August. 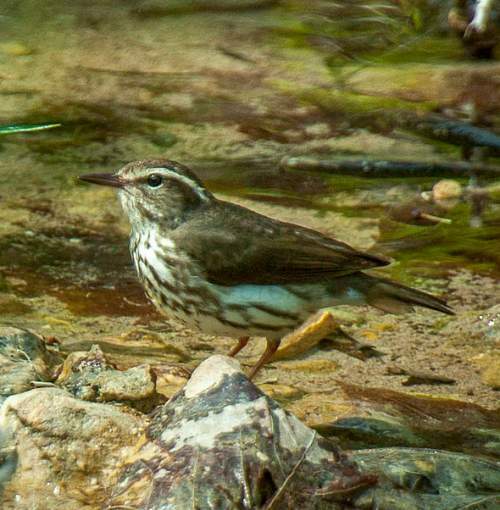 The wintering populations of these waterthrush species are distributed in Central America from Mexico to Panama, Caribbean islands and northern parts of South America. The return migration occurs in early summer. The global population size of the Louisiana waterthrush (Parkesia motacilla) has not been estimated. The overall population trend of the species is considered to be increasing. In most of its range, this species is reported to be uncommon to locally common. The generation length is 4.5 years. Its distribution size is about 3,520,000 sq.km. Ecosystem degradation, ecosystem conversion and capture of adult and juvenile birds for pet-trade are the main threats that may endanger the survival of the species. 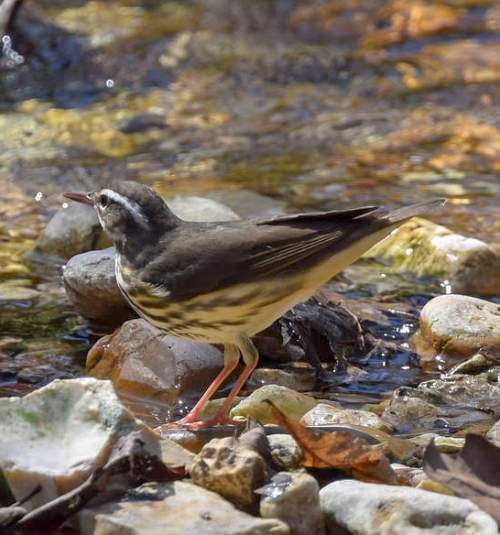 The Louisiana waterthrush (Parkesia motacilla) species does not approach the thresholds for being Vulnerable either under the range size criterion, or under the population trend criterion or under the population size criterion. 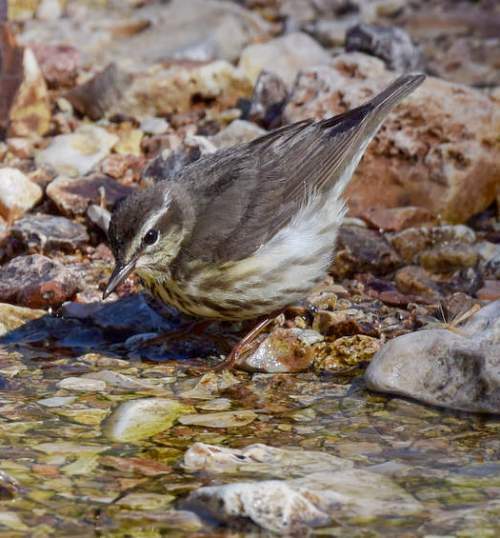 The IUCN (International Union for Conservation of Nature) has categorized and evaluated the waterthrush species and has listed it as of "Least Concern". 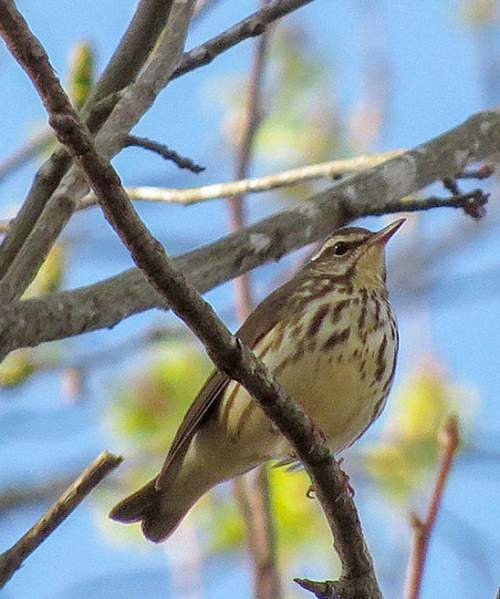 The CITES (Convention on International Trade in Endangered Species of Wild Fauna and Flora) status is ‘Not Evaluated’ for the Louisiana waterthrush (Parkesia motacilla). The Louisiana waterthrush (Parkesia motacilla) is closely related to the northern waterthrush (Parkesia noveboracensis). 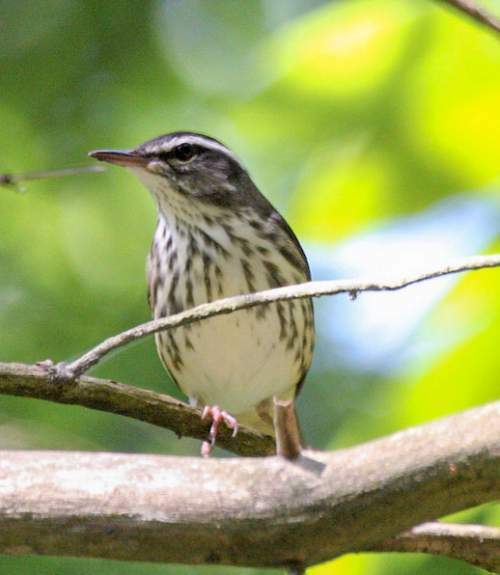 Recently updated and current topic in Bird World: Louisiana waterthrush - Parkesia motacilla.